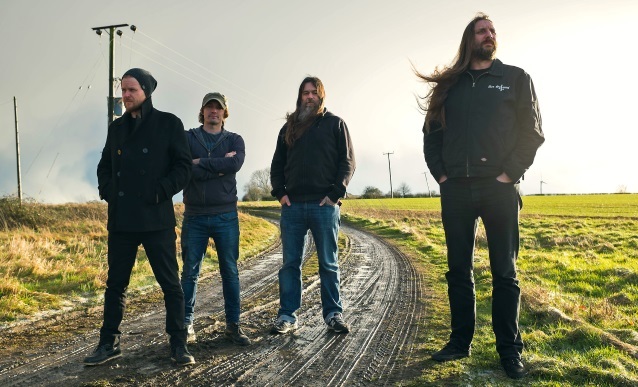 London, England's ORANGE GOBLIN has completed work on its new album, "The Wolf Bites Back", for a June release via Candlelight/Spinefarm. The nine-song disc was recorded at Orgone Studios with producer Jaime Gomez Arellano (GHOST, GRAVE PLEASURES, PARADISE LOST, CATHEDRAL). Vocalist Ben Ward commented: "We are very excited about this new album. 'The Wolf Bites Back' is our strongest and most diverse collection of songs to date, it's certainly a lot darker both musically and lyrically. It is still definitely a distinct ORANGE GOBLIN album but we have incorporated a lot more variation on this record and there are hints of CAN, CAPTAIN BEYOND, WISHBONE ASH and THE STOOGES nestling amongst the obvious SABBATH and MOTÖRHEAD influences. Lyrically, I have explored everything from alien serial killers to zombie biker gangs, Buddhist warriors through to descendants of the Salem witches!" He continued: "There was definitely a concerted effort to make sure all the songs could work in a live environment which gives the album a more raw, stripped-back feel — something that I feel has been lacking from good rock and metal in recent years. "Working with Jaime Gomez Arellano was really productive and a great experience, especially going back to tracking stuff to tape. I feel that he got the best out of all of us as musicians and songwriters and that really comes across in the songs, there is an air of confidence and experience. It was also a real honor for us to have Phil Campbell of MOTÖRHEAD lending his hand to a couple of solos on there, too!" The full track list and artwork will be released at a later date, but the band has confirmed titles such as "Son Of Salem", "Ghost Of The Primitives", "Burn The Ships", "Zeitgeist" and "Suicide Division". Artwork will be created by Roland Scriver at Familiar Ink.